My grandmother introduced me to the concept of weed teas, and although the weed drink recipes have been refined over the years, I still like to think of a simple weed tea as the best marijuana drink recipe. One of the latest in health trends is matcha tea, and with the explosion in weed drink recipe popularity, the two make a perfect combination: for both your health and keeping up with the trends. Not too sure how to make the perfect weed and matcha combination? We are here to help you, read on for a simple and delicious weed Infused matcha tea to get you buzzing in more ways than one. Firstly, you will need some Canna-milk. What is this? Quite simply, it is milk infused with cannabis. You can buy this online or make your own from scratch. 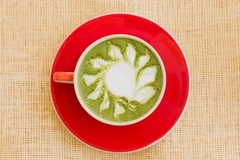 Once you have a smooth matcha and water blend, combine with the milk on the stove. Don’t over boil the milk, this can burn it and cause a nasty taste. The sweeter is not imperative and it is up to your own personal tastebuds. Last but certainly not least, enjoy this delicious weed infused drink recipe!